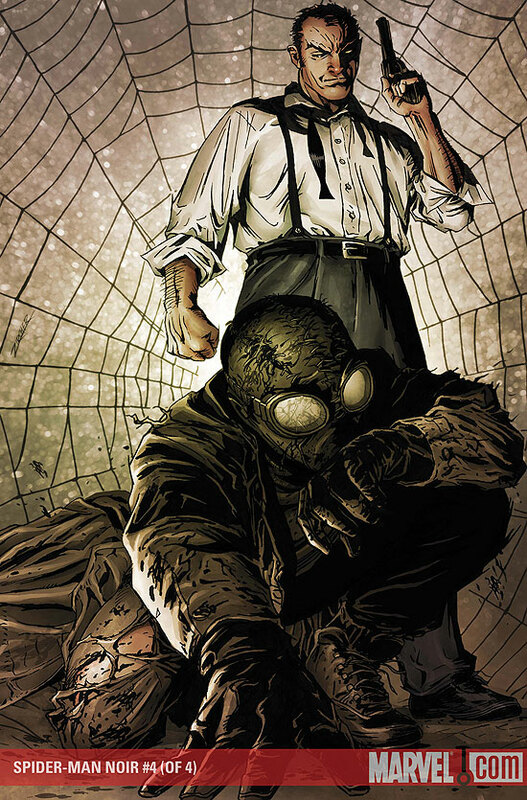 Spider-Man Noir is a Spider-Man from an alternative universe of Earth. While the main Peter Parker Spider Man is from universe 616, Spider-Man noir is from 90214. The noir universe resemble Earth in the 1920s -30s. As such it takes place during prohibition / great depression era in the United States. The stories appear in the similar dark Noir book / film style of popular detective dramas from the same era. Marvel has created promotion videos that introduce readers to Spider-Totems and also show where they are prior to the events of Spider-Geddon. Peter Parker is raised by his Aunt May and Uncle Ben Parker. His uncle is killed for inciting a strike at a sweatshop. Peter learns that his Uncle's death was at the hands of a powerful gangster who goes by the moniker, "the Goblin". Parker befriends Daily Bugle reporter Ben Urich. Ben takes Peter under his wing with the hopes that the two can expose the corruption of the Goblin. While on assignment Peter stumbles upon the Goblin's men moving stolen antiques. A spider statue falls and breaks releasing a mysterious wave or arachnids. These arachnids attack Peter biting him. The venom of the spiders causes Peter to black out. While he is out, Peter dreams of a mysterious "Spider god". When he awakens he learns he has spider based super powers (Similar powers of 616 Spider-Man). He fashions a costume out of his uncle's old WWI aviation gear. He then begins to attack the Goblin's operations. Peter finds that his friend Urich is blackmailing the Goblin aka Norman Osborn to get money to fuel his drug habit. Seeing this Peter loses faith in his friend. Later, Peter seeks out Urich's help but finds him dead in his apartment. Peter begins teaming up with Urich's girl freind Felicia Hardy to bring down the Goblin. Peter begins to have feeling for Felicia but it is unclear how much of those feeling are returned back. 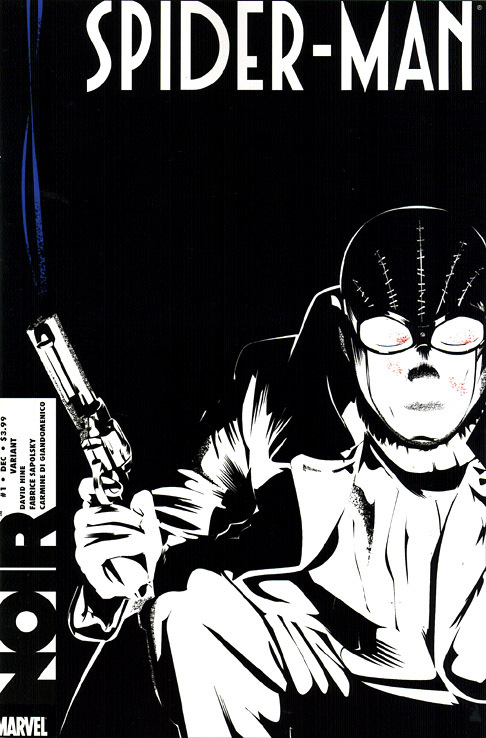 Spider-Man Noir continue to fight crime in the dark Marvel Noir universe. He will appear as part of the Spiderverse Spider-Man event where all of the spider totems (Those with spider powers) get together to face an evil group called the Inheritors who are hunting and eating their kind. He helps stop the Inheritors and trap them in a radioactive world. After Spider-Verse he joined the team Web Warriors. Spider-Man Noir rejoins the other Spider-Totems to take on a threat in Spider-Geddon. 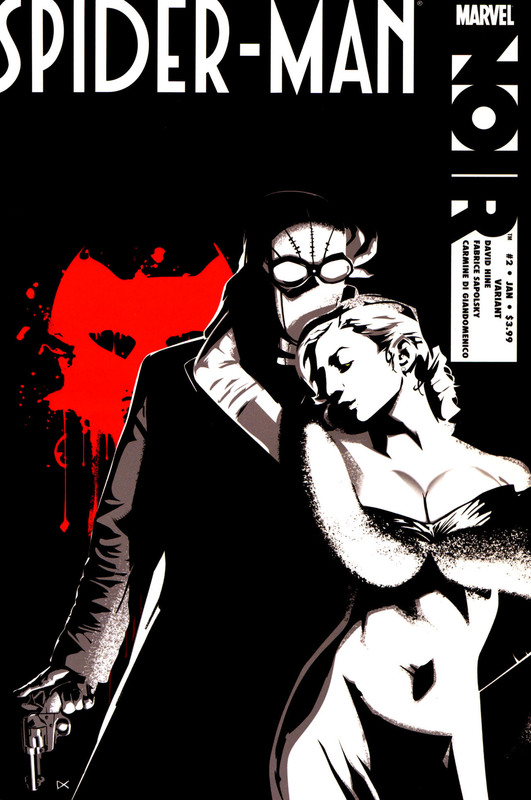 Spider-Man noir has a variation of the traditional Spider-Man powers. Can make organic webbing out of his hands. He can use the webs to climb and swing. He can cling to walls but it may not be as strong as the 616 version as he tends to move in a parkour (less Spiderlike) style. He does not seem to be a scientific genius like his 616 counterpart. He also seems more willing to kill. Also often uses a gun.